Open the trunk all the way. If it is not fully opened, the trunk lid may begin to close under its own weight. Prevent exhaust gas from leaking into the vehicle. 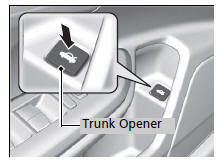 Pressing the trunk opener on the driver’s door unlocks and opens the trunk.